So instead, we went to the restaurant next door, which happens to specialize in one of my favorite things: dumplings. And not just any dumplings, soup dumplings! Lunch was delicious but what was even more fun was the fact the the mall was all dressed up for Chinese New Year. There was red and gold everywhere and tons of little table stalls set up for vendors to sell things. Chinese New Year Fairs/night markets are a big deal and part of the whole Chinese New Year tradition. They stalls sell all sorts of things – traditionally there are some flower stalls, lots of stalls selling lucky food items, and nowadays, stalls selling things like cell phone accessories and cute socks. I picked up some cute socks while we were at the mall so I could have new socks to wear on New Years (very lucky!). As we were walking around, I noticed a lady and her mom with some giant inflatable bananas. This year is the Year of the Monkey, so bananas is a thing, I guess. I happen to like giant inflatable food stuffs so I totally had to get my hands on one. I kind of sort of chased the lady down and asked her where the bananas were from and by the time I got to the banana place, there was a huge line. But, I was patient and even though for a while it looked like they were going to run out of bananas, I persevered and got one and Mike got me one too. I’m going to take it as a premonition of good luck! And, to maximize my good luck this year, I’m definitely eating whole fish. 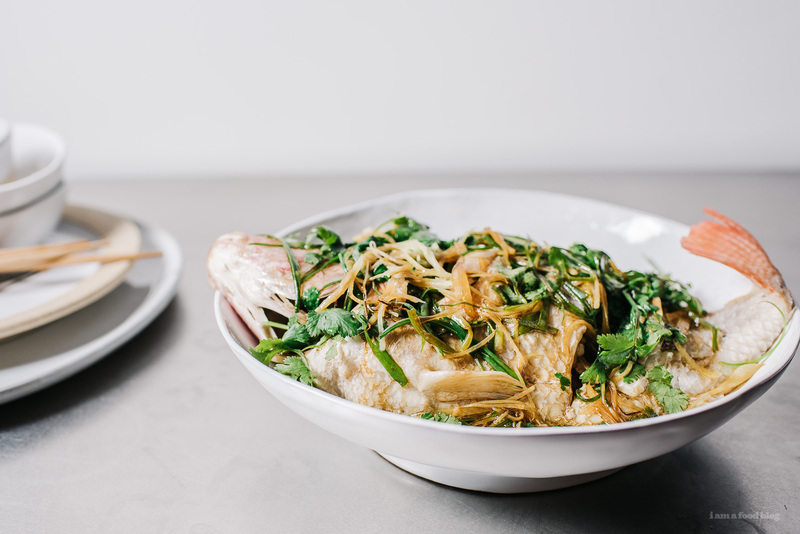 Chinese steamed fish is one of my favorite ways of making fish: it’s healthy because it’s steamed and it’s delicious because it’s served with soy, scallions, and ginger. 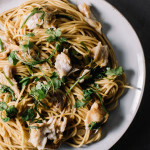 I mixed up the fish and sauce with some spaghetti because long noodles mean long life and without noodles, it just isn’t a party. Eat fish. 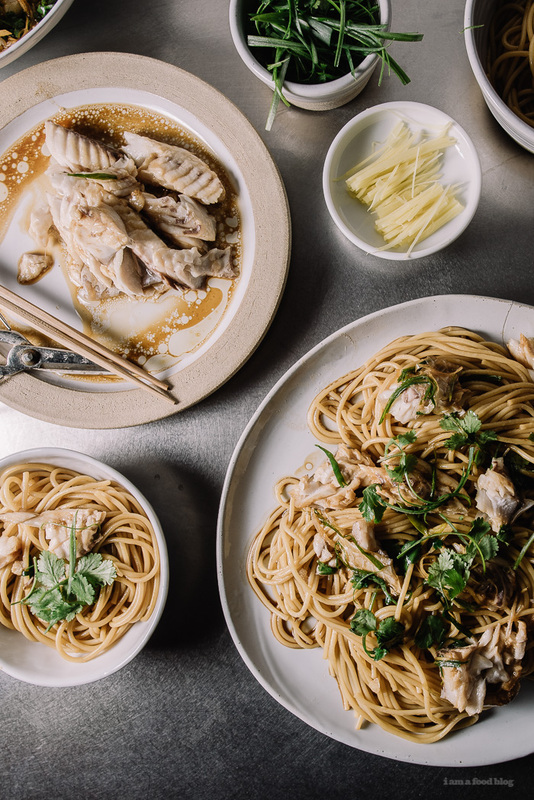 The word for fish sounds like abundance, so Chinese people love eating fish on Chinese New Year Eve and Chinese New Year Day because it means that the whole year will be filled with abundance. Eat dumplings because dumplings kind of sort of look like gold ingots, so if you eat dumplings you’ll be rich! Eat noodles because they represent long life. Make sure there are some oranges in your house (both for eating and displaying). The word for orange in Chinese sounds like gold, so it’s kind of like leaving gold lying around so you’ll be extra rich in the new year. Bask in your ultra-rich and plentiful luck in the New Year. Bonus: If you’re really, really interested in the Year of the Monkey being extra plentiful, make sure you buy and cook two whole fish. Eat one fish on Chinese New Year’s eve but make sure you leave the head and tail intact. The other fish should be left whole and untouched. Place both in the fridge and then the next day, eat the extra fish for dinner, this insures that your year will be full of abundance. Wishing you guys the happiest Year of the Monkey! 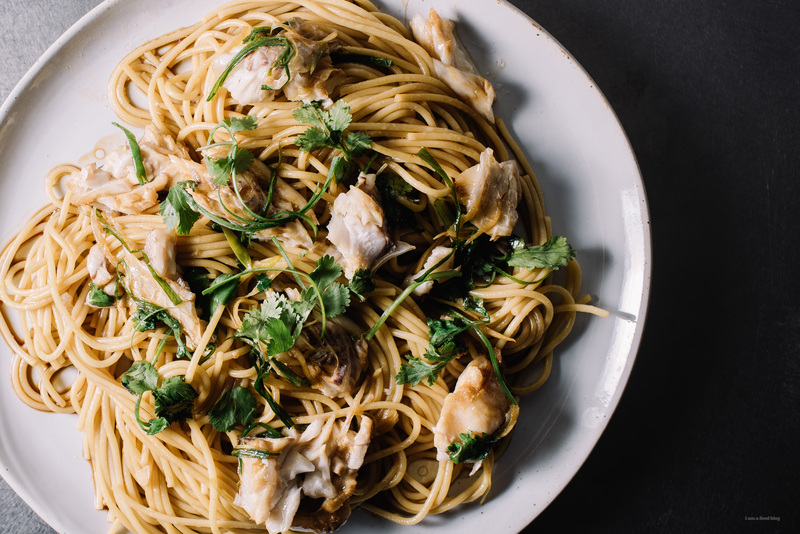 If you’re looking for a lucky fish dish, then definitely make this with whole fish. Otherwise, If you’re steaming filets they won’t take as long to cook, depending on the thickness of your filet. For filets 1 inch and thicker steam for about 10 minutes. For thinner filets, check at 7 minutes. If the fish flakes, it’s cooked. I prefer tilapia, but any white fish will work as well. 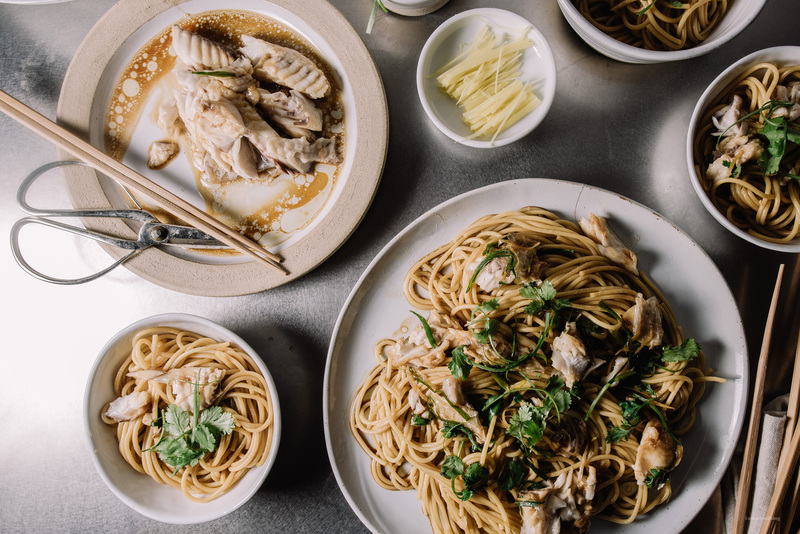 Place your steamer rack inside your wok. Add enough water to come to the base of the steamer, about 2 inches. Do not let the water come above the steamer rack. Cover the wok and bring to a boil. Bring a large pot of salted water to a boil for the spaghetti. While your water is coming to a boil, prepare your fish. Make sure all of the scales are removed and use a pair of scissors to trim off the fins, leaving the head and tail intact. Cut three slits on each side of the fish. 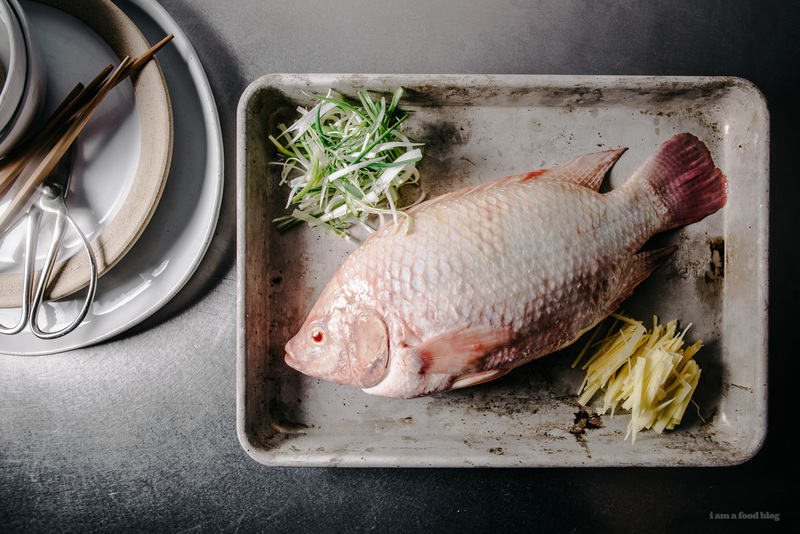 Lay the fish down in a shallow dish large enough so that the fish is entirely in the dish. Top with the half of the ginger, green onion, and cilantro. 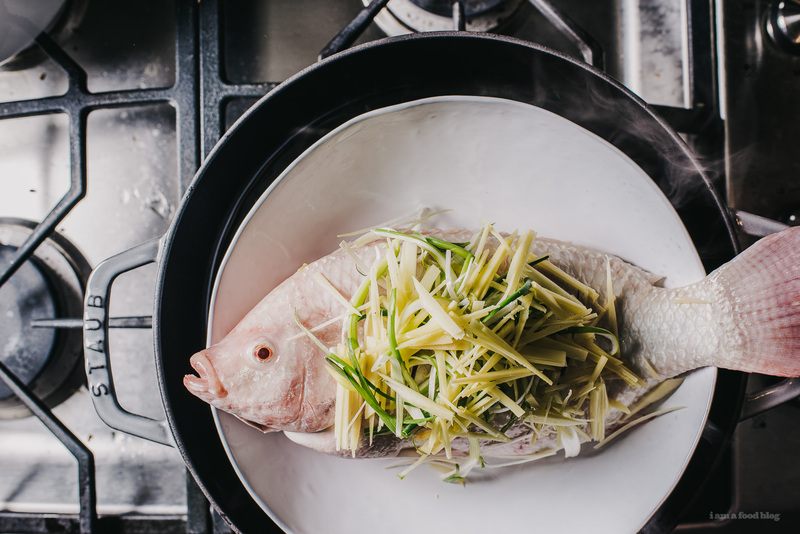 Once the water has come to a boil it’s time to steam your fish. Wipe down the condensation that has built up on the inside of the cover. Place your dish on the steamer rack and cover. Turn the heat down to medium and steam for 8-12 minutes. While the fish is steaming, cook the spaghetti according to the package. After it is cooked drain well. Heat up a touch of oil in a pan and lightly cook the slice garlic. Add the spaghetti and soy sauce and toss well. Set aside. Check to see if your fish is cooked by poking the fish near the top fin. If it flakes, the fish is cooked. The flakes should be opaque down to the bone, but the bone should be slightly transparent still. Carefully pour off any of the cooking liquid that’s accumulated and place the remaining green onions and cilantro on top. Heat up the oil, with the remaining ginger, in a small saucepan until hot and shimmery. Carefully pour over the fish, green onions and cilantro. Drizzle on the sweet soy sauce and toasted sesame oil. Debone the fish: Use a spoon or butter knife and gently separate the meat from the back bone. Carefully lift it off and gently set aside. One the top filet is removed, it should be easy to lift the bone off in one piece. Take the remaining bottom filet and set aside. Pour the sauce over the spaghetti and toss. Taste and season with extra soy and toasted sesame oil if desired. Top with the fish filets and extra herbs. Enjoy! you speak my food love language. happy new year!! The video made me drool a little and I love the new layout. I love this post so much! So cool that you are sharing all the CNY traditions. Being Chinese myself (hence the name), I love all the food traditions that come with the holiday. 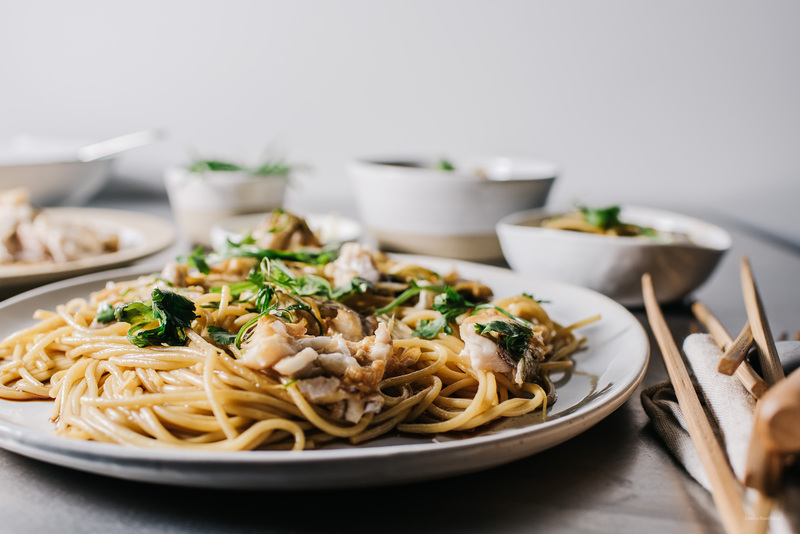 So clever that you added the fish to the noodles, a nice modern twist! I totally got socks at the night market, too! I went to the Richmond night market back in November and got 10 pairs (mostly the ones with cats on them, but also a pair of Obama ones ’cause….well, why not). beautiful! love the lil’ vid at the end. YUMMMM. This pasta is so calling my name. LOVED that video at the end. More videos!! Also, those socks and banana were the cutest!! Happy New Year! !